The temperature is hitting the 90s, the days are long, hot and humid, and the July 4 holiday is this Thursday. Yes, most people are thinking about baseball games, pool parties, tall glasses of super-cold lemonade and fireworks. But for all you creative types—you quilters, sewers, and fabric divas—your minds have also fast forwarded to the Christmas holidays and the search for great gift and decoration ideas. Winter placemat made with Christmas Joy panel print. 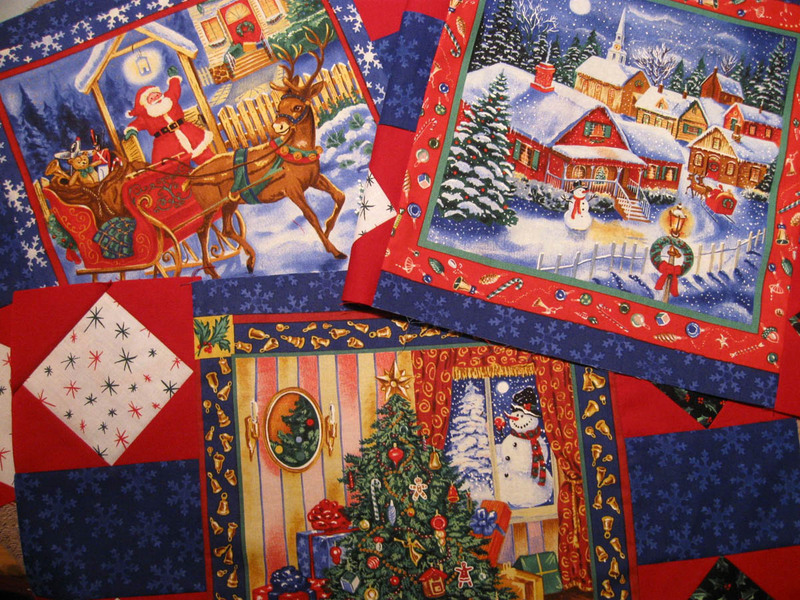 Many quilt shops are hosting Christmas in July events to provide inspiration and ideas for winter and holiday projects. Check YLS [your local shop] to see what they've got going. 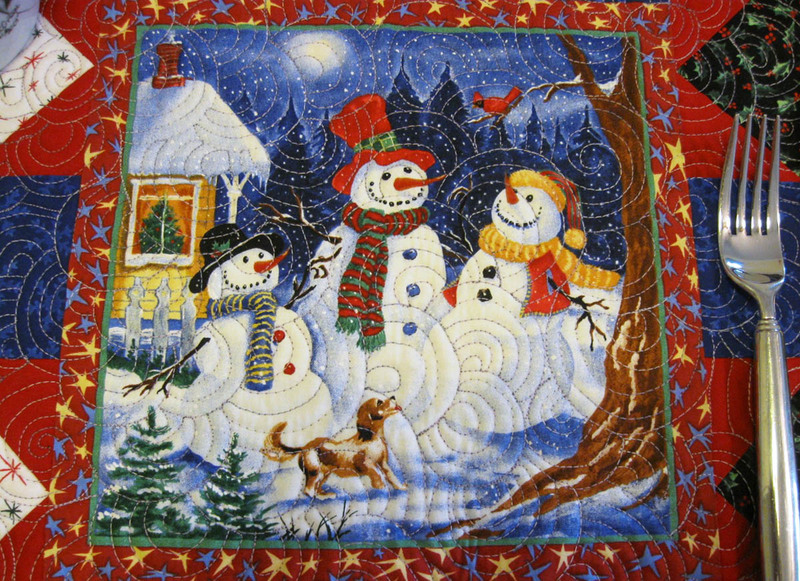 Christmas Joy from Blank Quilting is one fabric solution to the holiday quandary that I've been working with. Eight different 10" blocks comprise the Christmas Joy panel. This collection includes a panel with 8 charming holiday scenes, 4 coordinating prints featuring snowflakes and holly, and a focal fabric with Santa aboard a train traveling through a cozy, snow-covered village. I'm making placemats but there are plenty of possibilities with this fabric collection! 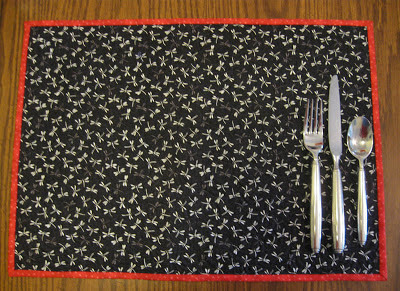 Free-motion machine quilting is easy to do on placemats. This is the center of the first of four placemats made from the panel. For all you quilters that have recently taken my Intro to Free-motion Quilting class, placemats are great small projects that will give you some hands-on free-motion experience! The 10" blocks from the panel would also make fun little pillows, chair seat pads, or pick your favorite scene and make a mini hanging for the front door. They could also be combined with pieced blocks for a cute lap quilt. Use a coordinating fabric for the back for year-round use. 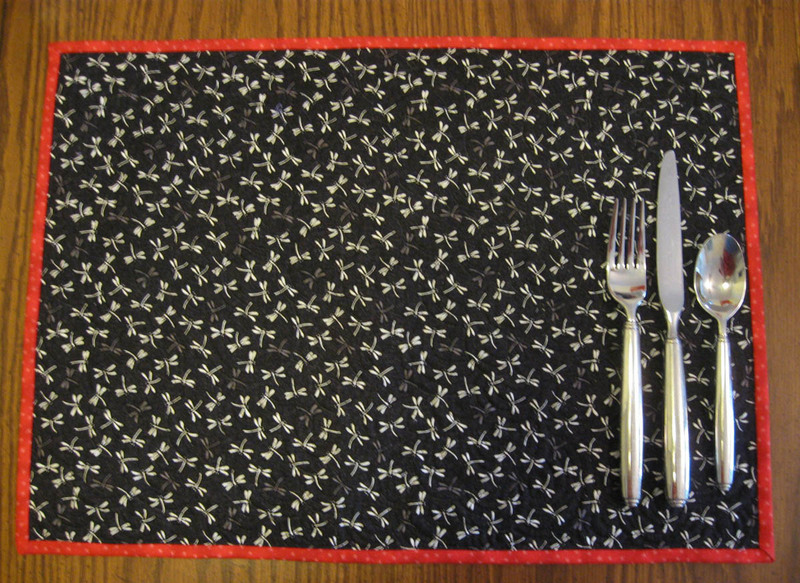 To make my placemats more versatile, I chose a black/white print (Honeybell 6599) for the back which coordinates with my black/white kitchen. This way, they are two-sided. 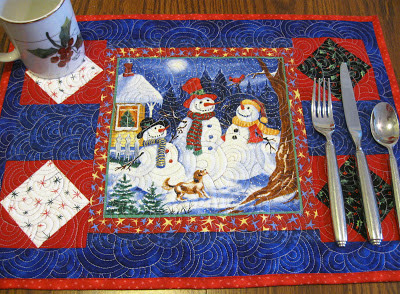 The binding fabric is from the Starlet blender collection (color name: red), and complements the fabrics on both sides of the placemat. Attach the binding by machine and you'll be finished in no time. So, does working with snow-themed fabrics make the temperature seem cooler? Hmmmm... What holiday projects and gifts are you working on?